Rachel Getting Married - DVD Review - Are You Screening? The person you see on screen most in Rachel Getting Married is Kym. 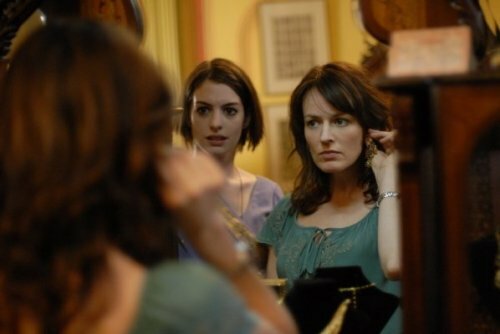 Played by Anne Hathaway, Kym is Rachel’s sister, and she’s on a weekend pass from rehab so that she can attend Rachel’s wedding. Because we are largely focused on Kym, a lot of people are going to start off talking about the film by pointing out a title/subject disconnect. That’s a mistake (and a natural one, since Jonathan Demme admits the title is basically accidental), but an interesting one. That’s because the film is about, with absolutely laser-accuracy, Rachel Getting Married, but what it’s “about” is connection and disconnection. Kym is a recovering addict, of the very serious variety, and the unsecret of the family is that Kym drove into a lake once while she was stoned out of her mind, and couldn’t get her little brother out of his carseat. Rachel has always been the solid, stable sister, and when Kym comes home to be part of the wedding, the sparks start flying in every direction. Dad and step-mom try to coordinate a peaceful event, but Rachel despises the fact that Kym always gets the attention, and Kym cannot take the constant bombardment of judgment. Mom makes a few appearances, but she shows up when she can to the rehearsal dinner, and leaves early after the wedding itself. As we go through the wild and tumultuous ride that is preparing for a wedding when many of the players find it difficult to avoid shouting at and/or attacking each other, it becomes rather clear that perhaps Mom is at the center of things. It is a subtle management of “becoming clear,” which might well be argued is actually something more like “to not become clear,” but the conversations are filmed so brilliantly that we get a fuller understanding of what conversations are. This is a film that is virtually all conversation, and we get a wide variety of them thrown at us, and with very specific intent. From scenes shot on handycam through a jumble of chaos as guests arrive, to beautifully-crafted arguments around a coffee table that remind so strongly of Altman, the master of conversation. In the midst of this, there is something in particular that everyone spends most of their time (and apparently most of their lives) not talking about. It’s the great disconnect in a group of people who try desperately to connect. The truth is, talking about something other than what you want to say is just easier. Hurtful things feel better when you’re hurt. In the end Kym talks about it, and maybe it turns out that things you do that destroy you were really done to you. And, the things that were done to you may have been done to you by someone else. When Kym goes back home after that encounter, we get three really long scenes in which no one does any talking. Because what you say when you aren’t talking is very real. What we know Kim and Rachel must have said to each other, though we don’t see it, is something we don’t need to see them say. It’s something they may not have said out loud, because they didn’t need to. And, in the case of another scene, the talking that happens after a prolonged experience of not talking, can only exist… after a prolonged experience of not talking. The almost bizarrely drawn out reception we see is a burst of reality (and stupendously diverse connection) into the lives of our characters, and that is because minute after minute of thoroughly intense “not talking” happens. At the end, the happy couple is found, removed from the crowd holding each other, gently swaying in each other’s arms. “This is not talking,” the sign reads. The unreality of talking that follows is forceful, almost distractingly so, because it follows so much “life,” which in the case of this movie’s goal might be seen as the antithesis of talking. During that unreality, Rachel and Kym look at each other with nearly blank expressions. They connect. During the wedding ceremony, Rachel gives us the old quote that the measure of a life is not how you are loved, but how you love. She gives us to understand that her husband personifies that idea so well that it makes him tremendously beautiful. She also tells us she wants to be like that. She gives us that for a very specific reason, which has to do with Kym, and perhaps the fact that she does not have a being stoned excuse for her actions. At the very end of the film, long after the wedding is over, Rachel gets married… and she gives us a jaunty, little jump. She isn’t talking to anyone. The entire film only exists so that those two seconds will have some meaning for you. There is a very real sense in which none of the rest of the movie is talking about what it’s talking about. There is a very real sense in which the rest of the film doesn’t exist at all, except insofar as you can only get here from there. The rest of the film, like life, is just a road. At the end of the day, you either give yourself a little, knowing smile, do a little jump, and realize that roads aren’t places… or, you don’t. The DVD has plenty of special features, but the only Blu-Ray addition is a BD Live feature which enables some download content and the ability to take a survey. The DVD has two commentary tracks. One is strictly Rosemarie DeWitt, the actress who plays Rachel, and while it is somewhat interesting, it’s an odd choice. The other is Producer Neda Armian, Screenwriter Jenny Lumet, And Editor Tim Squyres, and frankly it’s a somewhat odd choice as well. Neither are exactly compelling commentaries, and they lean a lot more toward anecdote rather than really telling you much particularly interesting about the film or its creation. The Wedding Band – This one, as you might expect, lets us into all the unique music we find in the film. It’s actually fairly interesting, because you get an inside look at an offbeat way to film. The film has no soundtrack, but instead has people playing music during the filming of the scenes. Several scenes are particularly interesting in that the musicians are playing in the downstairs of the house, while the scene is being filmed upstairs, and the musicians really only have a vague idea of what is going on. The highs and lows cannot really be “aimed” at precisely what is being seen, because they don’t know what that is. Also interesting to note here – there is a scene when Kym rather suddenly asks if we can’t get the musicians to shut up, which was not scripted. The actors played along with the idea, and it stayed in the movie. Behind the Scenes – This is a pretty standard feature of the general category, but when Demme pops in you’re going to get something a little different. There is some pretty good information in here, and anyone who enjoys the film will probably want to check this out. Cast & Crew Q&A – This is a live Q&A with several members of the cast and crew, and it’s not bad. There are moments where we get some decent insight into the roles and/or the efforts that went into the film, but like all such things we’re limited by the Qs. Overall, the DVD is a worthy purchase. This is a film that will at once divide people into two camps – those who will never watch it again, and those who will watch it repeatedly. It’s a solid release, and though the commentaries are not that great, the special features package is well done.